I missed President Obama’s inaugural address yesterday, but I caught the last part of the event and was excited and uplifted. 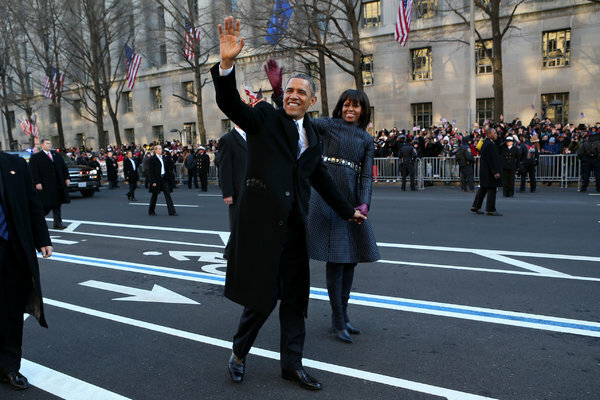 :: One of my foremost impressions of the inauguration was that it probably will be a long, long time before the nation sees a couple as handsome and appealing (appealing from the standpoint of vigor and well being) as Barack and Michelle Obama. The day’s events were a photographer’s dream. And how about Michelle? Wow, that woman knows how to dress! A fashion critic was quoted by CNN as saying her style is “ladylike with a twist.” The twist is that she always adds her own distinctive touch to her outfits. It perfectly captured the joy and celebration of the day. …I know. You Republican readers are probably curling your upper lips and muttering uncharitable things about now. But how could anyone say that the first couple and their daughters Malia and Sasha did not emanate vigor and electricity? :: Unfortunately, the inauguration wasn’t authentic from start to finish. I was shocked and appalled to learn Tuesday that a performing artist committed felony fraud. I can almost always tell when a performer is lip-syncing, but I’ll be damned if Beyonce (accent aigu over the final “e”) didn’t slip one by me. And by almost all other viewers, I’m willing to bet. At the end of her stirring rendition of the National Anthem, I was on my feet singing with her, just not quite as beautifully. And then I learned today that she did, indeed, lip-sync. As for Beyonce (accent aigu over the final “e”), I never heard her sing and never paid any attention to her before yesterday, and she’s now won a spot in my personal trash bin of overhyped musical artists. :: I’ve got to give credit to our hometown Kansas City Star, too, for the way it played the inauguration. A photo of a smiling and ramrod straight President Obama taking the oath of office, with Michelle holding two historic Bibles in her gloved hands, swept across the front page, down to the fold. Good call at 18th and Grand. Surely, a lot of Democrats who don’t subscribe bought copies when they saw it in the newspaper stands. And now, as the nation embarks on four more years under Barack Obama, I’m going to predict that he will be long remembered for, among other things, his achievements, his even temperament, his judicious choice of words, his humanness and, finally, for bringing us the finest first lady we could possibly ask for. 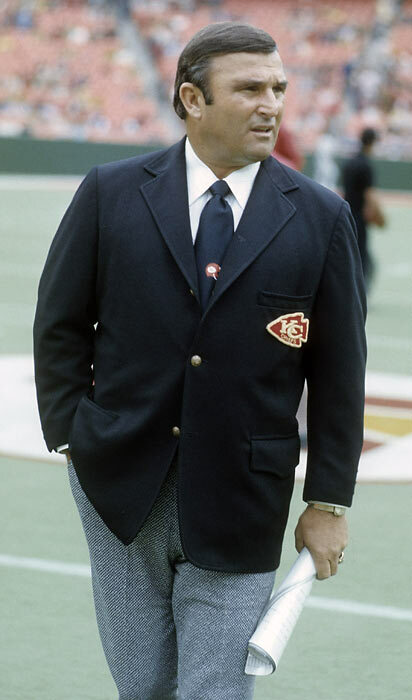 I’m startin’ to get pissed off…It’s that Andy Reid thing. 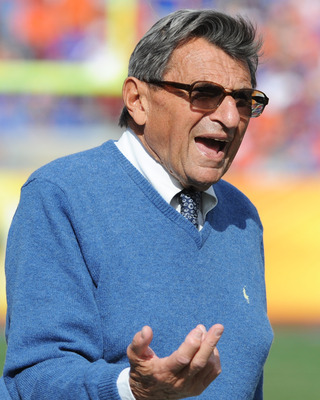 Not his coaching; it’s his sartorial inadequacy. If you didn’t see The Kansas City Star photo that I ran with yesterday’s blog, check it out. And on the sidelines, he looks worse. When I would catch glimpses of him when Eagles games were on TV, he didn’t cut a very appealing figure with that walrus mustache, ball cap and zip-up jacket. 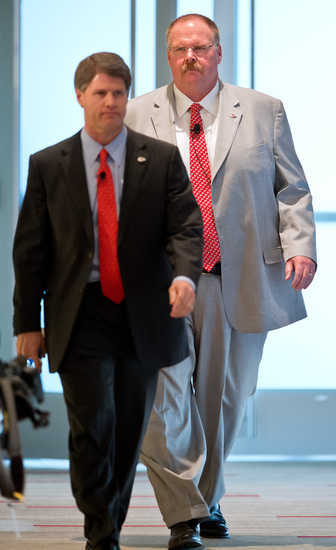 This deplorable situation got me thinking about some football coaches who really dressed well, even impeccably. 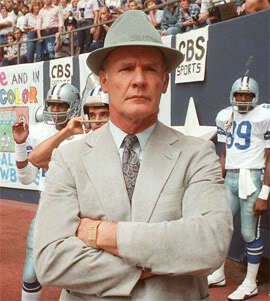 Former Cowboys coach Tom Landry…A winning smile is not necessary when you’re this dapper. Who needs a smile with hair like that??? 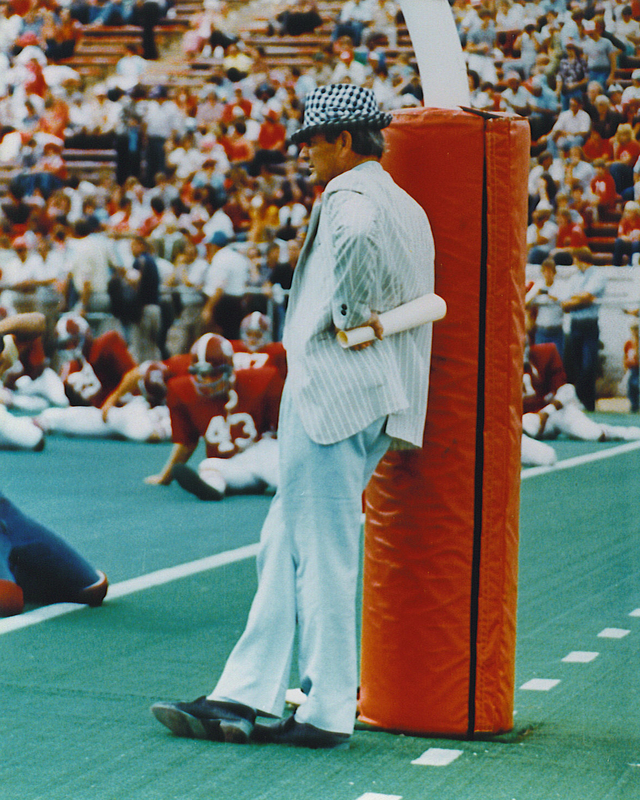 I noticed when looking at these photos that Bear Bryant always had a rolled-up program in his hand. Ah-ha! So that’s where The Mentor got his inspiration. The last few weeks have been great for newspapers — from the news standpoint, anyway. From Hillary Clinton’s concussion to the tax deal in Washington to the Chiefs’ lightning-bolt hire of a new coach, it’s been a windfall for us news hounds. Today, if you’ll indulge me, I’d like to comment on a few of the stories that have caught my attention. 2) Once again, the Jesuits have demonstrated that they are the best at educating our youngsters and doing everything possible to mold their students into responsible citizens. Rockhurst High School’s new drug-testing program, to begin next summer, is bound to intercept and redirect many students who are using recreational drugs, like marijuana. Wisely and correctly, Rockhurst officials are pitching the initiative as a “health and wellness” program. The first time a student gets caught, he will be brought in for counseling; the second time, he could be disciplined and will be put on notice; and the third time…well, he’s out. Not only does the program look excellent, but the way Rockhurst officials, including Principal Greg Harkness and President Terrence Baum, rolled it out was a thing of beauty. After two years of study and groundwork, Rockhurst officials informed faculty, students, parents and the news media in a matter of a few hours one morning last week. 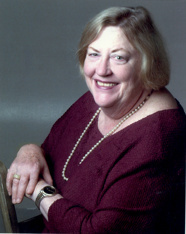 Then, Harkness answered questions from the media all afternoon, and several students were made available to discuss the program on the record and in front of cameras. Congratulations to Rockhurst on skillfully planning and publicizing this unprecedented program — unprecedented in Kansas City, anyway. 3) On the national front, President Obama has chosen an outstanding person, in my opinion, to head the Defense Department. You’ve got to love it, don’t you, when a guy like Chuck Hagel, who has been in the battlefield, says he views war as the very last resort? The last thing you want in that job is some trigger-happy muscle flexer who wants to crack skulls all over the world. I predict that the Senate will approve him. Yes, he made a big mistake in 1998 when he described a U.S. ambassador nominee as “openly, aggressively gay.” I’m sure, however, that his views on that subject have changed significantly — just like those of a lot of formerly homophobic folks. As liberal as I am, I have to admit that coming around to a “live-and-let-live” philosophy regarding homosexuality was difficult for me. 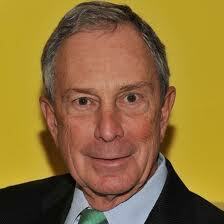 4) In an open letter in today’s New York Times to Mayor Michael Bloomberg, columnist Joe Nocera praised Bloomberg for wielding the shrillest and most effective voice on gun control. Nocera called on Bloomberg to go to bat for gun control with his energy and his money (net worth $20 billion, says Nocera) after his third and last mayoral term ends in December. 5) Let’s end on a head-scratching note…In a story out yesterday, some scientists have concluded that the cause of fingers wrinkling after being in water for some time is a function of evolution. Laboratory tests have confirmed a theory that wrinkly fingers let us get a better grip on wet or submerged objects, acting like a treads on a car tire. Now, if you’ll excuse me, I have to go bathe my hands and make a run to the Plaza to get as many coins as I can from the Mermaid Fountain.